This seasonal restaurant, popular with students at the University of Pennsylvania, sources all of its ingredients from farms no more than 50 miles away. 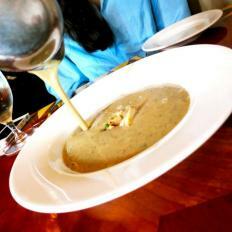 The signature mushroom soup is made with mushrooms that come from neighboring Kennett Square. The earthy soup is topped with a drizzle of white truffle oil, a dollop of creme fraiche and snips of fresh chives.